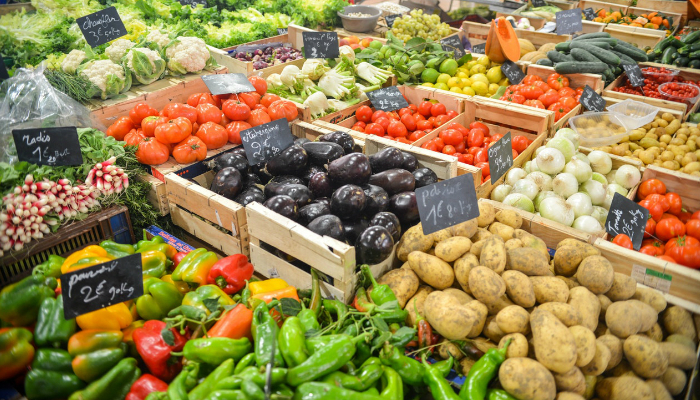 A lot of adults still dislike eating vegetables. Meanwhile, many people tend to forget their daily dose of fruits. These individuals surely lack some essential nutrients. Unfortunately for them, they get more exposed to the possibility of deadly health conditions such as cancer, stroke, and heart disease. If a person cannot consume two to three cups of vegetables and one to two cups of fruits everyday, he should really resort to the best organic multivitamin in today’s market. Wait, why does it have to be organic? First of all, the idea of a multivitamin is already enough for some people. Multivitamins are effective in providing essential vitamins and minerals your body needs when you cannot eat enough fruits and vegetables in one day. The danger though is how artificial some multivitamins are. It is like dropping toxic waste daily into your bloodstream. To lessen the possibility of harmful ingredients in a certain multivitamin product, choose organic all the way. This is even more applicable if you have children and you want only the best multivitamins formulated for kids. Now, you should not expect that an organic multivitamin only contains natural ingredients. The point of natural multivitamins is to make people consume fewer artificial components. That is enough to guarantee that your body will not accumulate toxic elements in the long run despite drinking multivitamins daily. MaryRuth Organics Highest Purity Ingredients Vegan Liquid Morning Multivitamin is filled with vitamins A, B, C, D3 and E. It also has a lot of amino acids and minerals to keep you energized the entire day. It does not contain gluten, GMO, dairy, wheat, nut, soy, nightshade, tomato, and white sugar. Instead of the usual corn, its vegetable glycerin is from palm oil. This organic multivitamin is formulated by a popular nutritional consultant named MaryRuth Ghiyam. It is not massively produced for a more meticulous quality control. So, only expect the best from it. The unique liquid feature aims for total absorption. 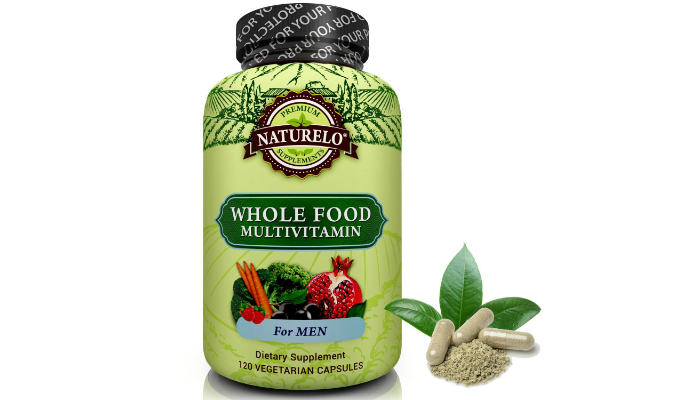 Lastly, this multivitamin is beneficial for both men and women. Its bottle is BPA-free. Supplements Studio 90 Capsules Non-GMO Whole Food Vegan All Natural Multivitamin contains vitamin K, turmeric, antioxidants, omegas, CoQ10, enzymes, and probiotics. On the other hand, it does not contain shellfish, gelatin, preservatives, coloring, and fillers. It aims to strengthen the immune system, nourish the heart, boost mental capacity, and prolong energy through its total of 23 vitamins and minerals. NATURELO 120 Capsules Men’s Whole Food Vegan Organic Multivitamin will improve metabolism as well as the overall health of the eyes, digestive system, bones, and prostate. It can also reduce muscle inflammation and stress in general. Its ingredients do not include caffeine and egg. 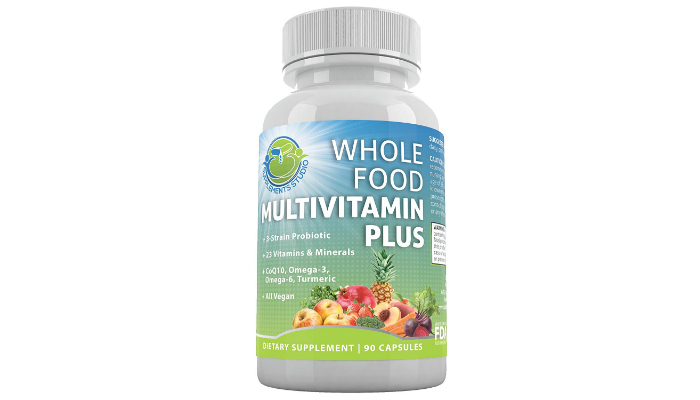 This organic multivitamin has vitamin C from acerola cherry to avoid synthetic ascorbic acid. It also has folate as a better alternative to folic acid. Its special organic antioxidants are astaxanthin, rutin, lutein, lycopene, Ceylon cinnamon, green tea, resveratrol, grapeseed, ginkgo biloba, and ginger. 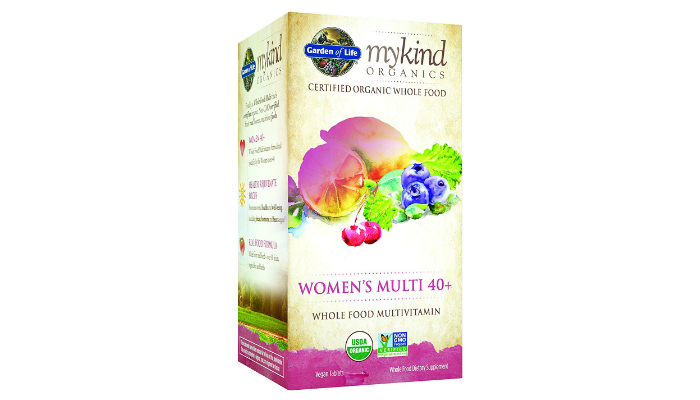 Garden of Life mykind Women’s 40+ Whole Food Vegan Organic Multivitamin promotes thyroid support by containing selenium and iodine. Since it is specially formulated for women, it can also boost hormone and breast support through its ingredients such as tomato, organic black cohosh, and vegan D3. 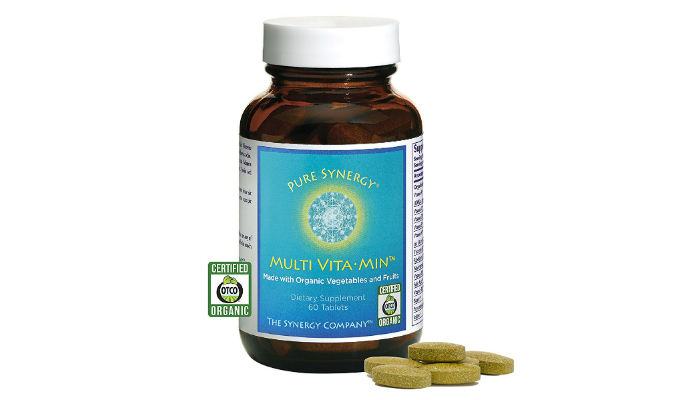 Pure Synergy 60 Vegetable Tablets Wholefood Multivitamin only requires two tablets every day but can already give you 200 percent of your daily vitamin needs and 100 perfect of trace minerals. Many multivitamins need you to eat food before intake. However, this one can be ingested directly before eating anything. Why? It is ideal even for the most sensitive tummy. 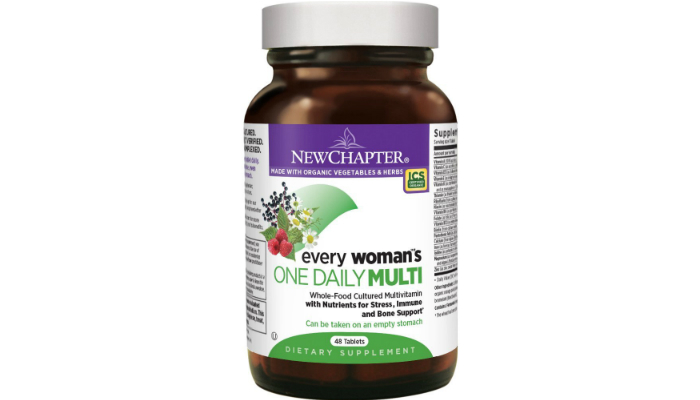 New Chapter Every Woman’s One Daily Fermented Multivitamin contains chamomile as one of its major organic ingredients. It is ideal for women who have an active lifestyle. It is not exactly a fun moment when you look at the label to check the ingredients. Some components are unfamiliar to you that you tend to get confused instead of convinced. Don’t you worry though; some ingredients are just alternatives or versions of the basic ones that you are definitely familiar with. Beta-carotene is the natural version of vitamin A. Meanwhile, the synthetic one is retinyl acetate or retinyl palmitate. Fortunately, manufacturers are required by the authorities to label vitamins perfectly based on origin. Next, vitamin C itself is the natural one while ascorbic acid is the synthetic version. Then, vitamin E has D-Alpha tocopherol as its natural form while DL-Alpha tocopherol is the synthetic. Be careful in reading the ingredients since some vitamins only have a slight difference between their natural and synthetic forms. Additionally, vitamin D’s synthetic alternatives are calciferol and irradiated ergosterol. With folic acid, it is pteroylglutamic acid. On the other hand, vitamin B12 can be cyanocobalamin. Lastly, vitamin B1’s synthetic counterparts are thiamine hydrochloride and thiamine mononitrate. Multivitamins are usually labeled as “organic” if the main ingredients are from plant extracts. These natural extracts should be rich in vitamins. One example we mentioned earlier is acerola cherry for vitamin C. This can actually be a factor to distinguish organic multivitamins from synthetic ones. When the ingredients list is more on plant names than specific vitamins, you are looking at a natural multivitamin. Obviously, another reason why you have to check the label is to identify bad components. 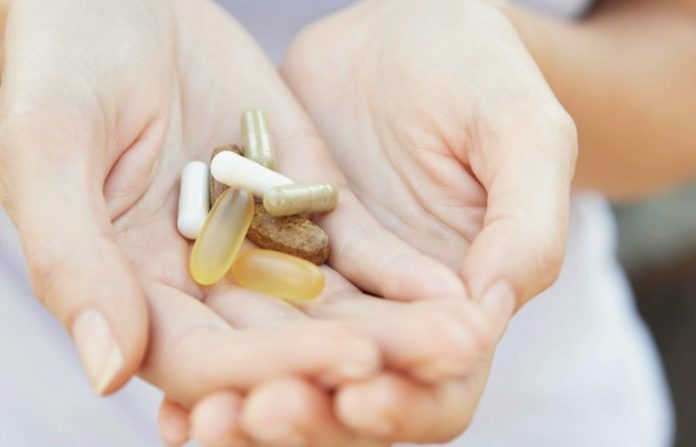 Multivitamins should not have fillers and dangerous compounds. 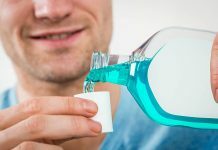 Never resort to products with substances or chemicals such as stearic acid or magnesium stearate, monosodium glutamate or MSG, and titanium dioxide. Stay away from salts like gluconate compounds, acetate, hydrochloride, nitrate, chloride, and bitartrate. Salts can actually be useful to stabilize the contents. However, they can also be fillers or additives that do not provide any nutrition. 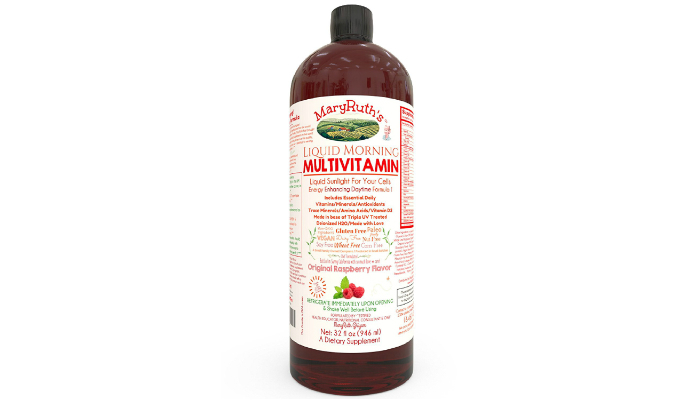 We selected MaryRuth Organics Highest Purity Ingredients Vegan Liquid Morning Multivitamin as the best organic multivitamin for most consumers. It is not your usual tablets or capsules. Instead, it is liquid to ensure total absorption of nutrients. In choosing the best organic multivitamin for your own lifestyle and needs, just look at the label. Remember the information we provided about the natural and synthetic versions of each major vitamin. Also, do not forget the common harmful ingredients we listed. However, it is always better to resort to healthy foods. To make it easier for you, purchase cookbooks focusing on nutritious meals. These cookbooks will surely give you quick and easy recipes. For more exciting ways to eat fruits, you may buy a yogurt maker and create your own flavors. If you prefer takeout due to your busy lifestyle, just remember to avoid foods that nutritionists won’t eat.